Last week I had the chance to talk on a panel called ‘planet friendly food’ at the Annual Meeting of New Champions in China. It is called summer Davos and that’s for a good reason. It’s an annual forum where over 400 lectures, workshops, discussions, panels and presentations were held. The topics vary wide and deep covering topics like cybersecurity, agile ethics, advancements in robotics, earth-data visualizations and off course the food system. Our panel was aimed to discuss how planet friendly food looks like and how technology could accelerate that. Workshops like this are aimed to advance the narrative from the last years where the message was that the food system is broken and that only a full system approach would define the potential solutions. 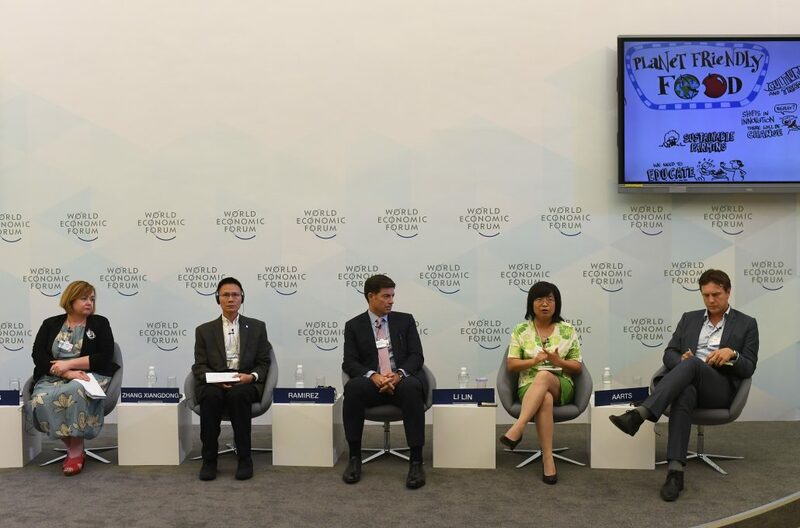 Our panel members were Megan Woods, minister of resources of New Zealand, Gonzalo Ramirez, CEO Louis Dreyfus Company, Chin Li, policy director WWF and Chin Li, Beijing Organics. Together we discussed in active setting with the audience how innovations could offer solutions towards planet friendly food and what the junction of policy makers, businesses and NGOs could offer to accelerate any such solution. This is the power of the forum, the multi-stakeholder approach whereby the problem is to be broken down to identifiable actions for each stakeholder. Especially in the food system I see this as not only relevant but simply a necessity as nothing can be done through cutting corners or by an individual actor alone. In my view food system innovations should hold clear and explainable economic, environmental impact an pose no health risk. When all those boxes are ticked, all stakeholders will move to make the innovation happen at scale. I am very positive about that mechanism for change. Consumer driven demand is now more powerful than ever. There is no 95% carnivore consumers vs 5% veggie veterans anymore. There is a kaleidoscopic increase in types of consumers and more than ever there are consumers actively seeking information on sustainability. We have Saturday Paleo’s, Wednesday white-meat lovers, flexies, vegans, animal-welfare-eaters, no-animal eaters and then there is this large group of cultural eaters. A fantastic increase of types of consumers, share of total consumers and interested consumers. That’s a huge business opportunity by itself and a grand engine for change. “Consumers are voters”; a point well made. But that offers two interesting challenges, one of short termism versus long-termism and the ability to drive change through legislation. We discussed that taxes can help but currently the change for instance to low-sugar diets is largely coming from well-informed consumers rather than tax schemes. They can however be effective to stimulate footprint reduction in existing production powerhouses like dairy in New Zealand. Exciting things happen there on methane reducing feed additives. Innovations from a technical perspective are not only exciting but induce great debate among consumers. Lab-grown meats, insect proteins, plant based meat analogues, innovations made real through great technological advancements. They are becoming increasingly available and as such trigger consumers to think about why they eat what they eat. They start asking questions like ‘where does my food come from’, ‘how is it made’ and ‘is it actually healthy’. Three of my favorite questions to drive awareness and subsequently change. Off course we also discussed how insects can offer a direct impact in reducing the footprint of the protein chain. By locally upcycling food leftover, a 1.5 billion ton of untapped resources, into high-quality, safe and inveronmentally friendly proteins. Chickens and fish love it and therefore the answer was easily given on the question why I fell in love with insects. Given the audience reaction I believe we won over some hearts on the bugs. Next week we will further deep dive on the specific topic of the future of meat from a planet friendliness perspective. That will be during the Sustainable Impact Summit days in New York where a similar workshop session will be held. Resource wise travelling always brings the question of value vs cost but next to offsetting the miles off course I feel these debates are gaining strong momentum and as such feel rewarding. On that workshop I will again report out. 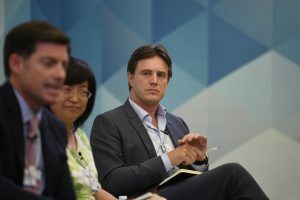 Kees Aarts, speaking during the session: Planet-Friendly Food at the World Economic Forum – Annual Meeting of the New Champions in Tianjin, People’s Republic of China 2018 Copyright by World Economic Forum / Valeriano Di Domenico .